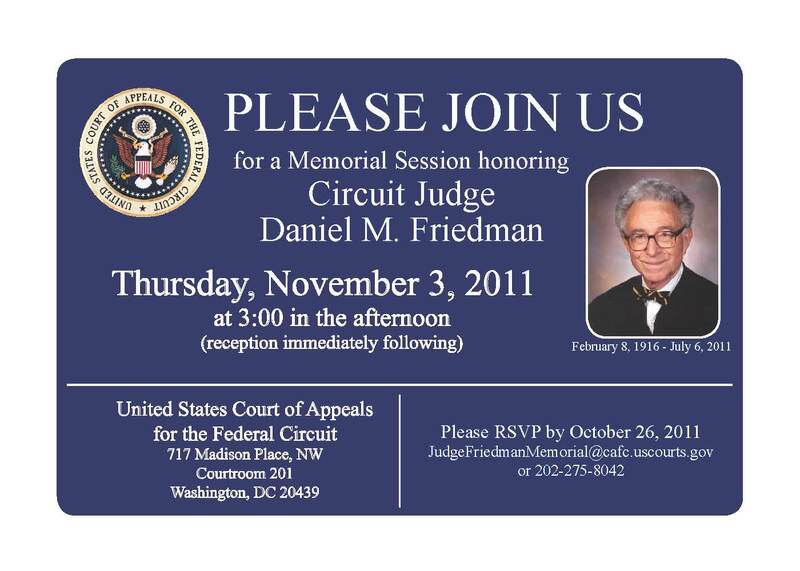 The Federal Circuit has announced a memorial session to be held for Circuit Judge Daniel Friedman, who passed away earlier this year. Recently retired Supreme Court Justice John Paul Stevens spoke at the University of Colorado Law School last night. He has a memoir scheduled to come out in early October. It will be interesting to see if it has anything to say about patent law. Chief Judge Rader and Prof. Sean O'Connor of "Pro Hac Vice"
Those of you in the Bay Area might want to take note that Chief Judge Rader will be speaking at the Court of Federal Claims Western Bench and Bar Retreat on October 18th. 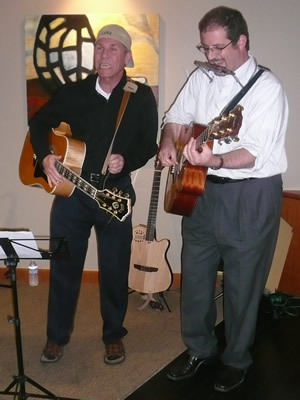 Apparently, Chief Judge Rader is a member of the band “Pro Hac Vice.” The band is scheduled to perform on the 18th as part of the evening ceremonies. I do not know if any of their hits are available on iTunes. You can see the schedule of events for the seminar to be held at the Claremont Hotel in Berekeley here: [Link]. Here is a link to a “Pro Hac Vice” performance: [Link]. Mayo v. Prometheus (Supreme Court): [Link]. Oral Argument Date for Akamai Tech. v. Limelight Networks and McKesson Tech. v. Epic Systems Corp. The date has been set for the en banc oral arguments of two divided infringement patent cases, Akamai Tech. v. Limelight Networks and McKesson Tech. v. Epic Systems Corp. The date will be Friday November 18, 2011. 1. If separate entities each perform separate steps of a method claim, under what circumstances would that claim be directly infringed and to what extent would each of the parties be liable? 1. If separate entities each perform separate steps of a method claim, under what circumstances, if any, would either entity or any third party be liable for inducing infringement or for contributory in-fringement? See Fromson v. Advance Offset Plate, Inc., 720 F.2d 1565 (Fed. Cir. 1983). 2. Does the nature of the relationship between the relevant actors—e.g., service provider/user; doctor/patient—affect the question of direct or indirect infringement liability? As a follow up to the Senate Judiciary Committee hearing for Judge Evan Wallach’s Federal Circuit nomination, he has submitted his responses to the Senate Judiciary Committee’s written questions. You can view his responses [here]. The questions were somewhat more pointed than have been asked of other Federal Circuit nominees. A panel of the Federal Circuit was trying to evaluate the construction of the term “bearer instrument” in a recent oral argument. Counsel for the defendant-appellee was explaining that, with respect to bearer instruments, title passes by delivery without endorsement. As an illustration, he used the example of Hans Gruber trying to steal bearer bonds in the movie Die Hard. [Listen]. While the analogy resonated with me, I couldn’t tell from the recording if it did with the panel. As it turns out, Hans Gruber is a very well-known character. He is the 46th most notorious villain in the last 100 years of the movies, according to the American Film Institute. You can listen to the entire oral argument in Privacash, Inc. v. American Express Co. et al. [here]. A week ago, there were at least three subject matter eligibility cases that had been orally argued but not yet decided by the Federal Circuit: Dealertrack v. Huber (argued on May 4th, Dyk, Linn, Plager); Fuzzysharp Technologies Inc. v. 3D Labs, Inc. (argued on July 7th, Bryson, O’Malley, Reyna); and Ultramercial v. Hulu (argued on August 4th, Rader, Lourie, O’Malley). The cases are of particular interest because they will continue to develop the court’s jurisprudence in the area of subject matter eligibility, post-Bilski. Moreover, with what appears to be significantly divergent viewpoints about subject matter eligibility by various Federal Circuit judges, as evidenced by the Research Corp. Technologies v. Microsoft and CyberSource Corp. v. Retail Decisions, Inc. panels, the earliest decision to issue will serve as precedent to subsequently decided cases. At first glance, one might have expected Dealertrack to issue first. As it turns out, it was Judge Rader’s panel in Ultramercial v. Hulu that took home the honors on September 15th. Now a cynic might wonder if this was “gamesmanship” in that the most-recently argued case was decided first and a mere six weeks after oral argument. However, in actuality, the Ultramerical case really only concerned the single issue of subject matter eligibility that had been decided on summary judgment by the district court. So, perhaps Ultramercial just happened to be an easy one. On another note, the Dealertrack decision should be interesting. The panel is comprised of Circuit Judges Dyk, Linn, and Plager. Judge Dyk authored the CyberSource opinion. Judge Plager was a member of the unanimous panel in the Research Corp. Technologies opinion. I’ll venture a guess that Judge Linn is authoring the Dealertrack opinion for the court. You may be familiar with Dr. Mehmet Oz who often appeared on the Oprah Winfrey Show. He now has his own syndicated televison show. This past August he and his co-inventors had a patent issue titled “System and Method for Determining an Objective Measure of Human Beauty.” It is patent number 8,005,270.
determining an enhanced user score indicative of the beauty of the selected body region after application of the selected enhancement. You can read the entire patent [here]. You are currently browsing the 717 Madison Place blog archives for September, 2011.